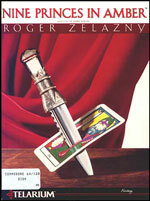 Notes In spite of the popularity of the novelist, Roger Zelazny, the game was not nearly as popular or successful. Very little information is known about the game and only one copy of the game is known to exist in full packaging. The walkthrough for the PC version has been included here in order to hopfully assist those players who want to try the game in figuring it out. Also, an item worth notiting is that this game was aparently programed by a team of 20 or more people.